There comes a time in every knitter's life when she or he is called on to do some baby knitting, whether for her own child or for a friend or family member. Some people are even motivated to start knitting because they want to make something for a new little one in their life. But not all baby knitting patterns are created equal, and just any old project won't always suit your needs. Here are some considerations you might want to think about when looking for baby knitting patterns. 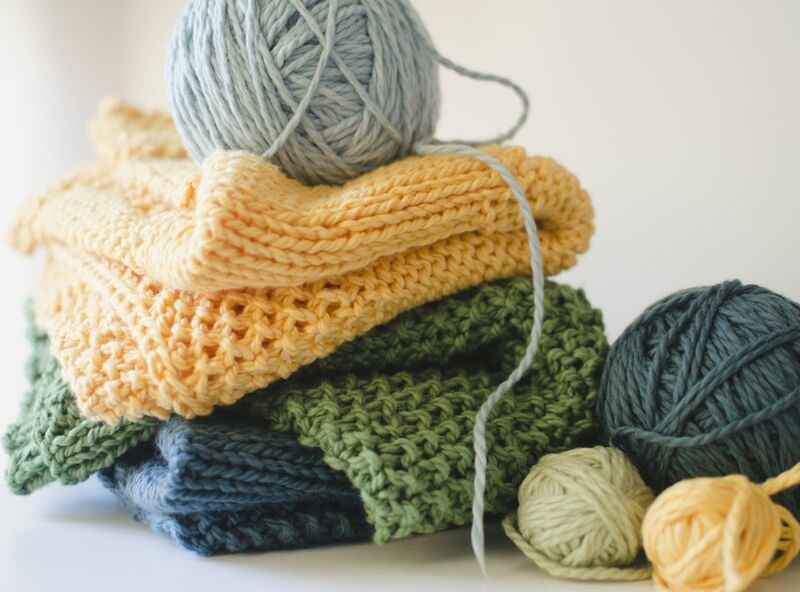 Cotton and washable wool are probably the most popular choices for baby things because they are easy to care for, but you'll find patterns running the gamut of fiber choices, from bamboo to cashmere, alpaca to silk. Of course a lot of the more luxurious knitting fibers are not so easy to care for, so consider the parents you are knitting for before you choose to knit an item that will have to be handwashed or that might not take kindly to stain treatments. When I knit for non-knitters, I try to choose yarns that are machine washable, but when I knit for knitters or others who I feel I can trust to take good care of garments that need a little more attention, then I'll bring out the alpaca and other handwash fibers. No matter what fiber you choose or who the gift is for, it's always a good idea to include care instructions in the package. When it comes to knits for babies and small children, there are two main things to consider in terms of how items are constructed and worn: ease of putting on and taking off and safety issues. It can be difficult to get items over the heads of babies, both because they tend to have large heads and because they don't like things that go over their heads. A cardigan, V-neck or kimono-style top is a much better choice than a crewneck. Of course comfort is an issue when it comes to the choice of yarn, too. Babies have sensitive skin, so the softer the yarn you choose, the better. The other piece of the construction issue is safety. Projects without long ties are good choices, because ties can get caught in small spaces and pose a strangulation risk. If buttons are used, make sure they are sewn on very securely. Using a zipper instead of buttons may make more sense for small children who may pull off a button and swallow it. You might also want to think twice about projects that are very lacy or have a lot of small holes in them. Small children can potentially get caught in such garments, but the beauty of a lace receiving blanket or a blankie with eyelet edging can't be denied. It's just something to consider. For some people it's hard to resist those pastel pinks and blues, but some parents don't like the cliches and may even be trying to limit those colors in their baby's life (or they may not know the gender of the child until it is born). For that reason it pays to talk to the parents before you start a project to make sure that the color you've chosen will work with the parents' preferences. You don't want to spend a long time making a garment that will never be used because the recipient doesn't like the color. The final important consideration when contemplating baby knitting is whether you want to knit something that will be considered an heirloom or something that will be used day in and day out. Most people I knit for get items that are meant to be used well, which is another good reason to use machine washable fibers. But every now and then a special child will warrant a more precious project (like that lace receiving blanket mentioned above). In that case you can probably choose a fiber that needs more attention when cared for because it won't need to be washed as often as, say, a blanket used daily for tummy time. Your relationship to the person you are knitting for and the amount of time you have to spend on the project will likely play into your decision about what exactly to knit and whether it's an item for everyday or something to be treasured (which is not to say a project can't be both). And there are times when all logic goes out the window, you find a perfect pattern or a beautiful yarn and you just have to knit it, even if it's not the most sensible choice. That's a fine way to choose a project, too.